These flowers are anemone coronaria – the ‘Lily of the Field’ in Luke 12:27. A rich legendary history is associated with anemone. It is said that the anemone originated from the blood of Adonis, and even the Romans considered it valuable in preventing fever. Often anemone is applied to bruises and freckles. In Chinese symbolism, the anemone is equated with death. The flanking panels of the window are mirrored designs featuring 7 lilies and 7 gold stars on a rich blue background. Madonna lilies and stars are associated with the Virgin Mary. Seven is a number associated with the Feminine in many traditions and to Mary symbolically in her image as representing the perfected human soul. The four panels are linked by a running frieze top and bottom of red anemones and green leaves on a blue background. They are based on Goan/Portugese tile designs in recognition of the donor’s country of origin, Goa in India. Materials used are antique, streaky and plain flash blue and with red on clear and red on green flash for the frieze flowers. Processes used were sand blasting, acid etching, stain, paint and enamel. 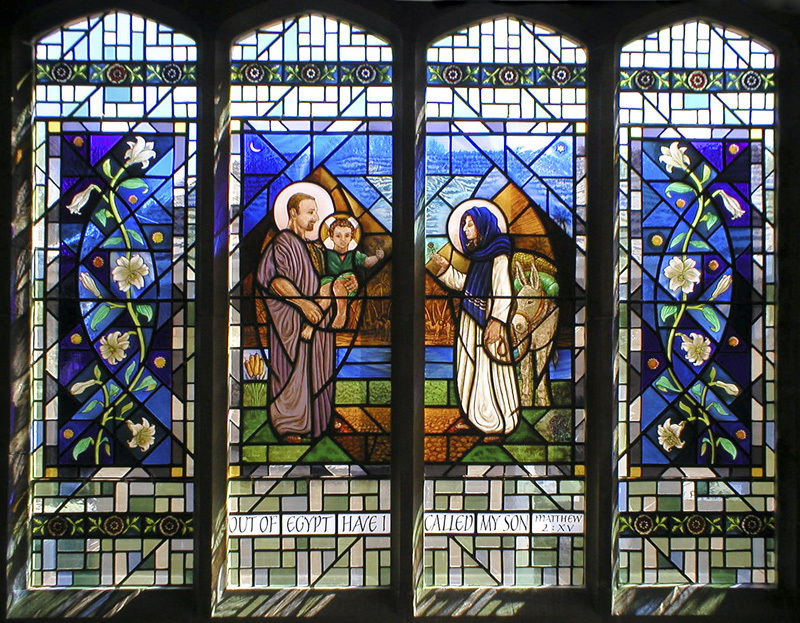 This window was donated by Joseph Pereira in honour of his family and designed and painted by Delia Whitbread MA(RCA). Liz Daly designed the calligraphy for the text. Leading and Installation work was by Sharon Price and David Knowles respectively of Godstone Glass. 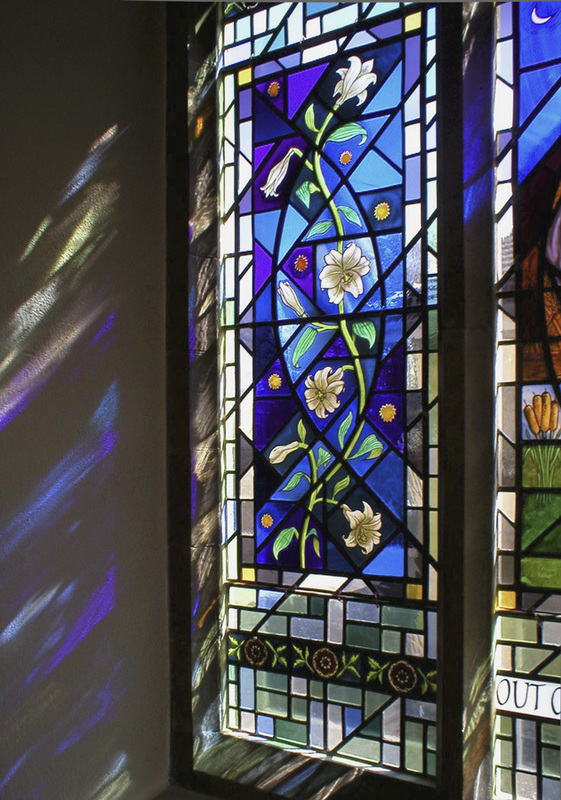 The window can be seen by arrangement with the church on 0208 303 1957. With thanks to Rev’d Nadim Nassir (The Trinity Institute for Christianity and Culture) and his sister Houda, Johana Rogers, Peri and Neil + Ayshe Orhan-Pennel, Vivien and Freddie Wheeler for inspiration as models. Also Larry the donkey at Hackney City Farm.